Check out our upcoming and past events below. This Friday, April 12, we will be releasing our spring draft release, The Rainbow Project, a blend of sour wheat and blond ales aged in oak wine barrels for up to 18 months with orange, lime and lemon zest as well as whole Northwest-grown strawberries. 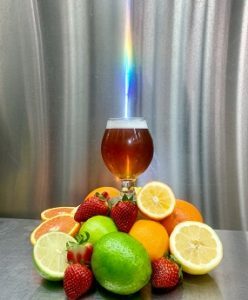 Offering a colorful combination of fruit varieties, this seasonal draft-only release delivers a brilliant polychromatic spectrum of citrus and berry flavor. This beer will be available as a draft only product at both Cascade pubs, and to our wholesale distributors.